Grasses and Mites and Mammals, Ya-hoo! 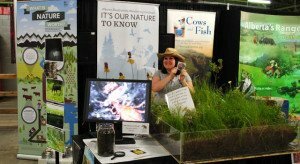 The ABMI Talks Biodiversity Monitoring at the Calgary Stampede. On June 21st, the grounds of the Calgary Stampede were literally underwater, submerged due to heavy and unrelenting rain in Southern Alberta. Amazingly, Stampede 101 opened “come hell or high water” on July 5th and was as fun and entertaining as ever. Now, imagine yourself in the middle of a busy farm, packed with horses, pigs, cows and people. 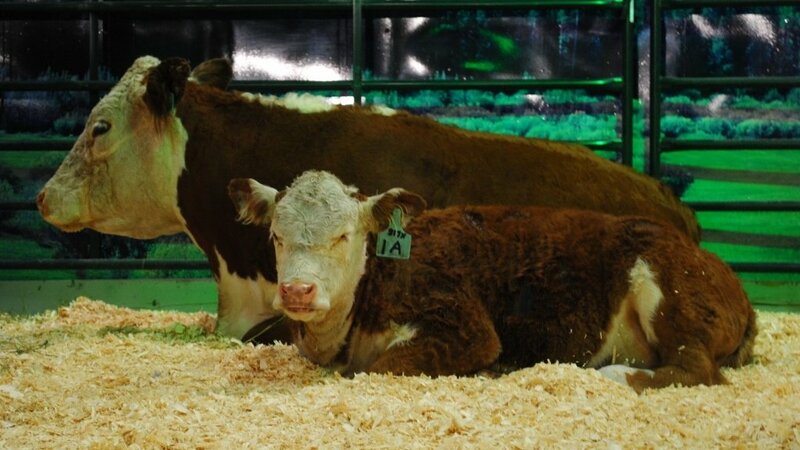 Think of the sounds of hoofs clopping, the smell of, well, a cow-filled barn, and the sensation of humid summer heat trapped inside a massive crowded building – welcome to the Cattle Trail! 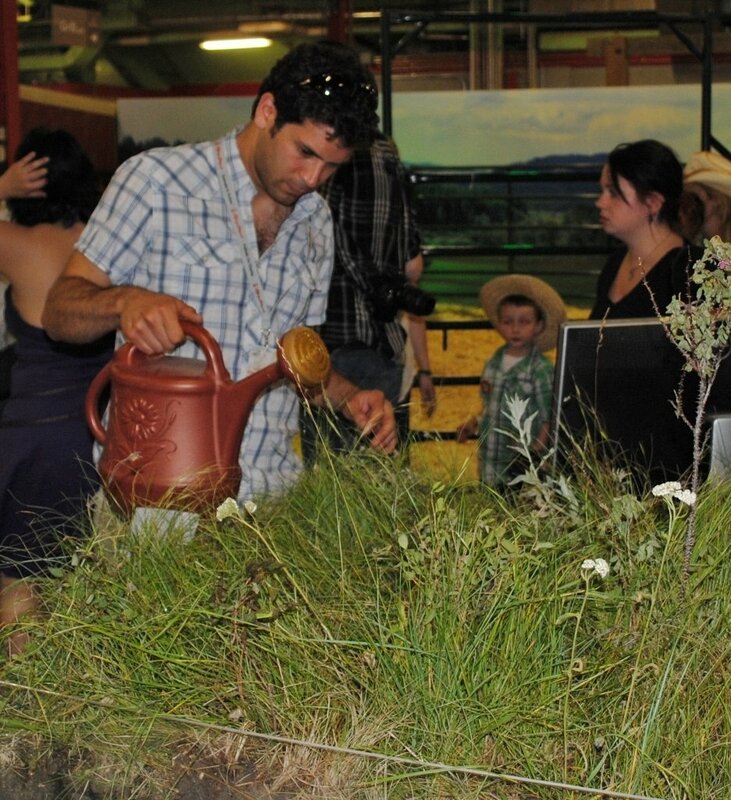 The Environment Booth was, in fact, the first stop along the Trail, and challenged visitors to see native prairie as both a working landscape, as well as home to a wide range of biodiversity. The ABMI’s display “Native Prairie by the Numbers” introduced folks to the some of the wildlife we monitor, starting with the hidden and mysterious world of soil mites. Our video footage of mites in action (eating pollen grains, attacking each other, and more) was a definite hit, although, some Stampeders may joke that it was more like a nightmare! 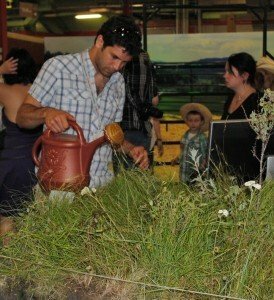 ABMI volunteers described the essential role mites play in nutrient cycling in the soil and how their activities support the productivity of the grassland. Perfect segue… to our square metre chunk of native prairie. Visitors were challenged to guess how many species of plants could be found on the chunk (21! – including wild strawberry, three-flowered aven, and prairie sage). Many were surprised to learn how diverse our native grasslands are, giving them a new appreciation for the fields they see out their car windows. Further down the Environment Booth, people learned about the birds and mammals that also live on native prairie. The ABMI’s bird recordings rang out while visitors were able to feel (samples provided by ACA) fur pelts (Wolverine, Red Fox and Lynx), handle real skulls and antlers, and examine the beautiful display of Canada’s largest hawk: the Ferruginous Hawk. Cows and Fish also shared a fun quiz game to teach visitors about Alberta’s riparian zones. Despite a frantic start, the ABMI was overwhelmed by our great experience in Calgary. To witness the outstanding results of so many people’s relentless efforts was truly inspiring. Knowing that where we stood throughout Stampede was under several feet of water only two weeks prior, it was hard not to stop and think about how unbelievable it was to even be at the event. The large, curious and enthusiastic Stampede crowd truly made our job easy, and we look forward to returning next year with a fresh slate of fun ideas.